When she cooks on her daytime talk show or on 30 Minute Meals, Rachael often uses what she calls a Moppine. In my house, it was always a dishtowel, but I'm not Sicilian. 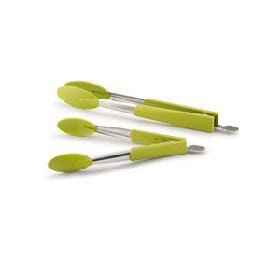 They sell them for 9.99 each at Bed, Bath, and Beyond. According to the description, this is a 2-in-1 kitchen item, since it is both an oven mitt and kitchen towel. 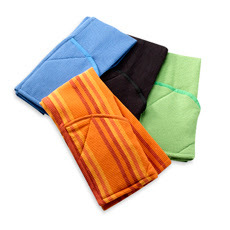 It has "heat resistant pockets for easy and safe handling of hot items. Simply hang it up to dry after using it on wet items." It's 100% cotton, measures 28" L x 18" W, and is machine washable. Next up, Rachael created the Young Cooks Cutting Sets. 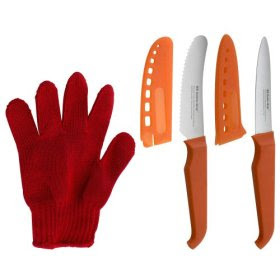 These come with tools that will help kids to help you out in the kitchen, with safer knives, a cutting glove, and blade covers. Last, but not least, Rachael came out with a whole new set of stainless steel cookware. This stuff is looking pretty sleek. 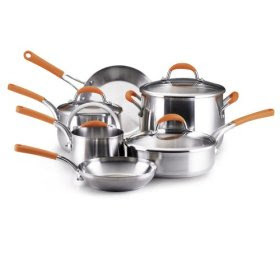 You can either get the 10-Piece Stainless-Steel Cookware Set or you can purchase individual pieces. Okay, I think we're all caught up now! See, I love the look of the stainless steel pots, but I've had a set of them in the past (another brand, the ones I got when I got married) and I prefer hard anodized cookware because it's so nonstick and so durable! But those look really nice! I'm starting to really like the hard anodized too (I have RR's oval saute pan, which is hard anodized). However, with Barkeeper's Friend, cleaning the stainless steel ones is pretty easy.